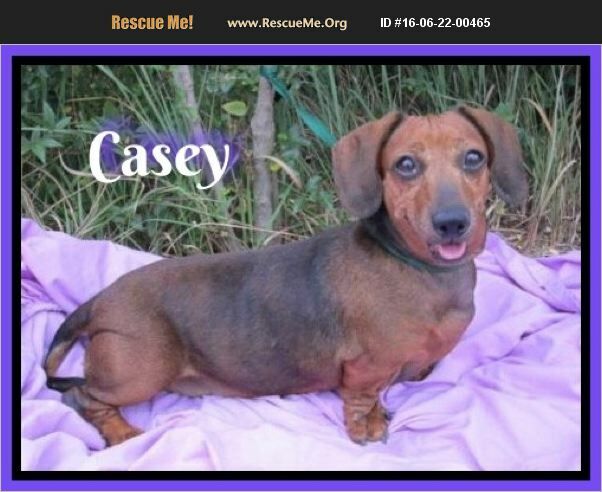 Casey is a happy laid back 12 year old, 13 pound senior girl looking for a quiet forever home. Casey likes other dogs but does keep to herself and likes to sleep on a nice pillow. She LOVES to eat and needs to be fed only at meal time. She will grrrrr a little bit if another dog approaches her food dish so it would be best to feed her apart from any other dogs in the home. Casey is crate trained and dog door trained. She is house trained, but does not seem to like to go potty on the grass. Like all dachshunds she will need to be confident in her environment to have good potty habits. All rescue dogs go thru a period of adjustment so understanding and patience is important. Casey is a very quiet girl. She enjoys a warm lap and very much likes men. She has not been cat tested but her foster mom thinks she would ignore them. She is not interested in toys. This sweet girl would just love to be in loving arms and a warm bed. From her wonderful foster home in Alabama, she is waiting. Won't you make her dreams come true?